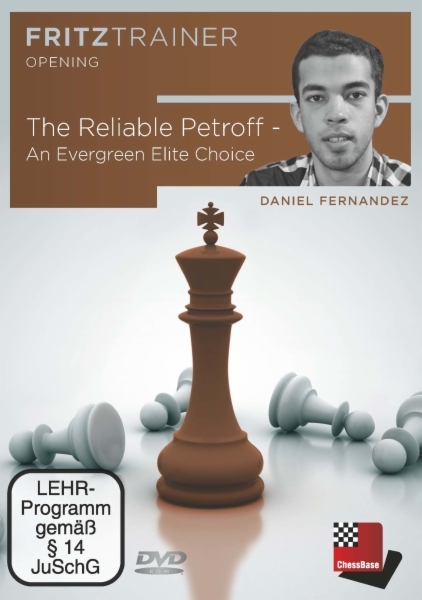 The Petroff (or Russian) Defence which is characterised by the moves 1.e4 e5 2.Nf3 Nf6 has been popular at the highest levels for many years and enjoys the reputation of being an extremely solid defence. In the 1990’s and 2000’s, the theory of this variation began to develop quickly, when players like Kasparov, Karpov, Anand, Adams and Kramnik infused it with new ideas for White and Black. Adams and Kramnik continue to rely on the Petroff, and they have been joined by the 2018 World Championship challenger, Fabiano Caruana. As with many openings favoured by the world elite, there is a sharp contrast between the sidelines (in which understanding plays the most critical role) and the theoretical battleground of the main lines where experience and knowledge of plans are needed, but also a high degree of concrete knowledge. This DVD aims to present this knowledge in a structured way, so that players can pick exactly what they need. This is interspersed with discussions of structural themes and annotated games. Two particular structures are discussed in great detail. But the author is not tied down to dogma, and suggests two relatively minor lines for Black which can alleviate the problems, either practical or objective, which Black has been facing in recent games in the 5.d4 and 5.Nc3 lines respectively. Daniel Fernandez has won several national junior championships during his career and is currently the youngest Grandmaster in the UK. He is renowned for his versatile and solid style. His thematic, “systems-based” approach to chess is well suited to explain openings in a systematic and structurally-driven way, as he showed in his book The Modernized Caro-Kann. He is a regular columnist for ChessBase and CHESS Magazine and has coached several of the new generation of English talents. During the British Championships 2017 he worked as a commentator. RAM or better, 100% DirectX10 compatible sound card, Windows Media Player 11, DVDROM drive and internet connection for program activation.